Gordon W. Tasker ’47 (BUS), former chairman of the Board of Trustees, died at age 97 on Feb. 7, 2019, in Palm City, Florida. 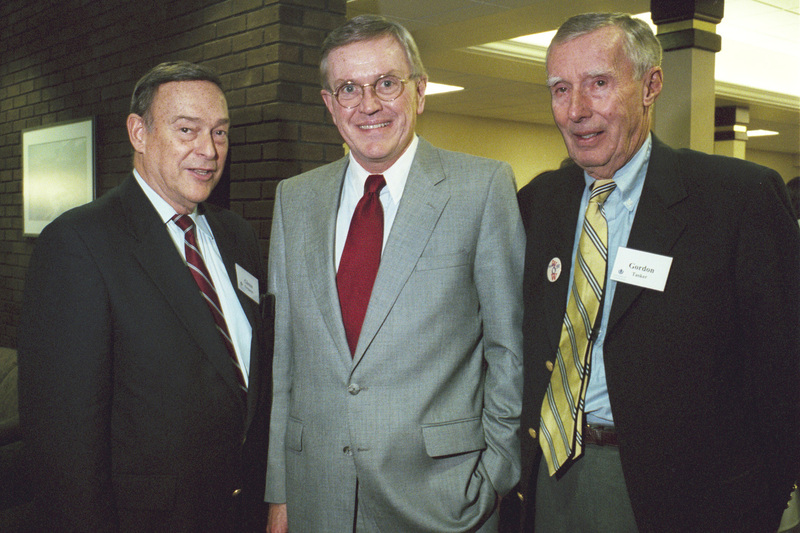 Tasker served on the University’s Board of Trustees from 1969 to 1980, including nine years as board chairman. Additionally, he served as a volunteer chairman for several fundraising efforts of the UConn School of Business, where he was also a part-time faculty member. The middle child of three children born to Scottish emigrés Walter Tasker and Ada Harris Tasker, he was raised in West Hartford, Connecticut. After graduating from Hall High School in West Hartford, he was accepted to UConn in Storrs, but his education was interrupted by military service during WWII. Tasker spent several years stateside in the Army prior, to shipping out as part of the force for the invasion of the Japanese homeland. With the end of hostilities, he became actively involved in the occupation of Japan. Upon arriving home, Tasker returned to UConn, where in 1947 he earned a bachelor of science degree with distinction in public accounting. Tasker was a retired partner of PricewaterhouseCoopers, where he had been managing partner of the Hartford Office before transferring to New York City to assume international client responsibilities. His commitment to his profession was highlighted by his service to the American Institute of Certified Public Accountants (AICPA), where he was a member of the National Review Board. He also served as a member of council for the New York Society of CPAs, and Connecticut Society of CPAs. Among other awards, he received the 1970 Merit Award from the University of Hartford Accounting Society for outstanding service to the accounting profession. Equally committed to serving his community, Tasker served as chairman of the Connecticut State Chamber of Commerce; member of the Board of Directors of the Greater Hartford Chamber of Commerce; member of the Board of Directors of The Institute of Living; and member of the Board of Directors and Finance Committee of Church Homes, Inc.
Tasker always had a special relationship with UConn, where he served on the Board of Trustees from 11 years, including a nine-year tenure as chairman. His tenure spanned the terms of three university presidents and three Connecticut governors. An alumnus of the UConn School of Business, he was also a part-time faculty member, and a charter member of the School’s Alumni Hall of Fame. In addition, he assisted the School in its fundraising efforts. He was recognized for his service to the University with the UConn Alumni Association’s University Service Award in 1978, and by the Board of Trustees, with the University Medal in 1990, in recognition of his outstanding professional achievement, leadership, and distinguished public service. But it was having the undergraduate admissions building named for him, the Tasker Building, in 1998, that truly touched his heart. In 1943, while stationed at Fort McClellan in Anniston, Alabama, Gordon married Priscilla Storrs, also of West Hartford. Their marriage lasted until 1977 and produced two children, Richard Storrs Tasker of Atlantic Beach, Florida, and Elizabeth T. Davis of Bethesda, Maryland. In addition to Rick and Beth, Gordon leaves his wife of 42 years, Ruth Spencer Tasker, as well as grandchildren Carter Davis, Elizabeth Lozner, and Chesley Davis and great-grandchildren Masie Davis, Gibbs Davis, Edyth Lozner, and Olivia Lozner.